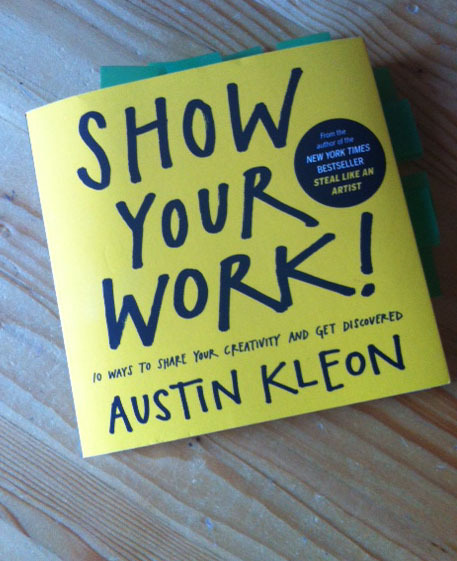 Austin Kleon’s Show Your Work, is a great follow up to his highly successful Steal Like an Artist; once you have been inspired and created work, you need to share your efforts with the world. Show Your Work is very simply written, using bold statements, art/poetry, quotes, and hand-drawn charts to elaborate on the author’s ideas. 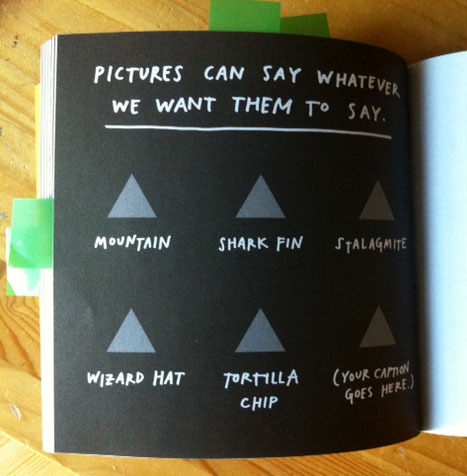 I appreciated Kleon’s bare bones style of writing; for this subject matter it really helps to get the point across simply and makes what he is saying memorable. The main subject of the book is to get your work out there, and learn new and effective ways of self-promotion for your artwork. I have found other self-promotion or marketing books to be more complicated or difficult to translate to the business side of being creative. Show Your Work takes take the complication away and makes the subject matter instantly relate-able. From my own past experience, self-promotion has seemed intimidating, but the straight-forward way Kleon presents his material can help motivate even the meekest self-promoter! He recommends beginning the process of sharing by first documenting each day what you do at different stages of your process. After compiling this daily log that you create for yourself, you can choose what would be most interesting and valuable to share with others via your blog, e-newsletter, or social media outlet. 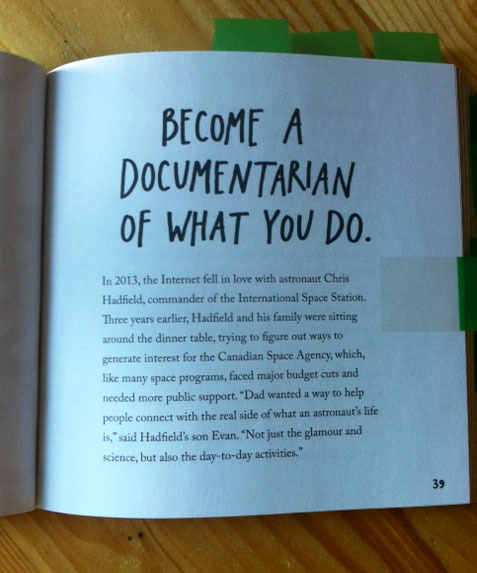 Sharing what you’ve been working on is definitely important, but as Kleon mentions in Chapter 7, there is so much information being thrown at us via the internet and email, we don’t want to become “Human Spam” to others. This brings up a very important and helpful point. Networking is not only about tooting your own horn and saying “Look at me!” Kleon offers that listening is an important part of the sharing process. By listening you may learn something that will help your work and you may also be able to offer something to the person to whom you are listening to. 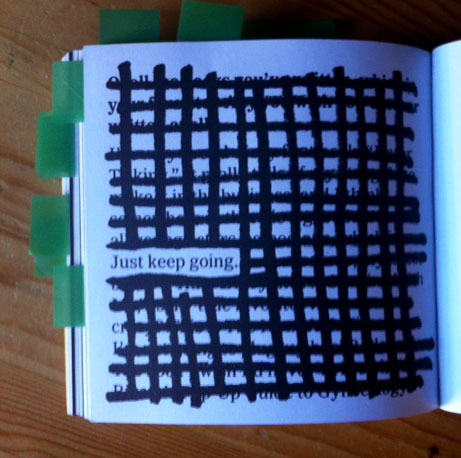 Being a “connecter” rather than just gaining “followers,” sharing ideas or aspects of your creative process, and showing true interest in others work are some of the ways Kleon suggests widening your circle of fans. This is a point I really appreciated since many artists are natural observers and listeners, and the old concept of self-promotion seemed like it was based on constantly promoting oneself. The aspects of the book that I’ve discussed here were the most powerful to me, but Show Your Work contains much more. I had heard some of the advice before, but the way it was presented and explained made it innovative and I think even the most seasoned self-promoter can use a reminder, breath of fresh air on the subject, or an update. Check it out for yourself and see if you found it as helpful as I did!